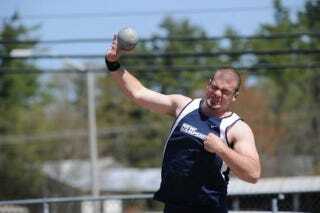 Cameron Lyle is a senior at the University of New Hampshire and a member of the track and field team, focusing primarily on the shot put. In his sophomore year, the team encouraged players to join the bone marrow registry and Lyle signed up and got his mouth swabbed. Two years later, he learned he might be a match for someone—donors and donees must remain anonymous for a year. A few weeks ago he learned he was a 100 percent match. Lyle will be donating to a 28-year-old male who is suffering from acute lymphoblastic leukemia. Time is a factor and due to the donee's condition—he's been given six months to live, without a marrow donor—Lyle must donate now or never, which means he can't finish out the track season. He'll undergo the procedure at Massachusetts General Hospital in Boston and won't be able to lift anything over 20 pounds for weeks. It's a bummer to essentially forfeit the remainder of a collegiate career, but he made the decision pretty easily, so he's winning at being a good dude.